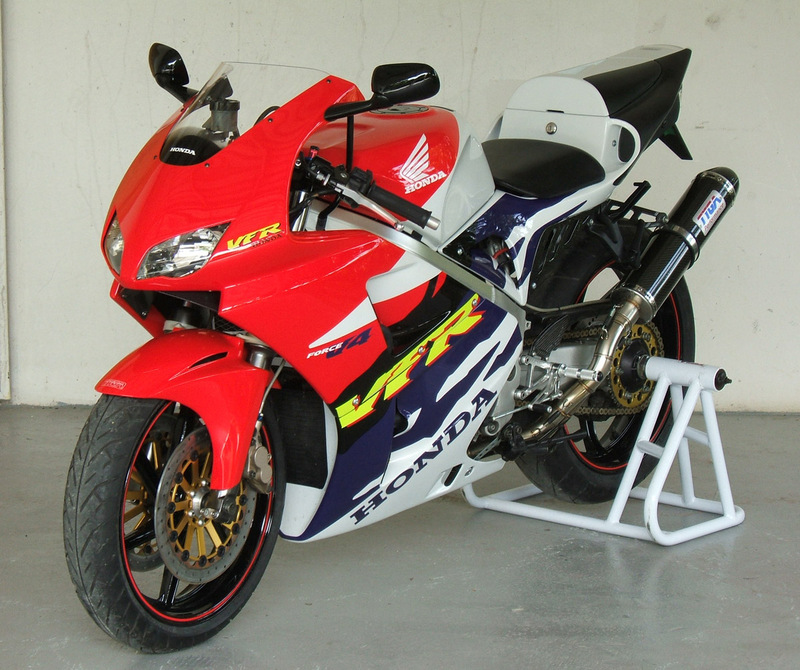 Here we have the latest incarnation of our long term NC30 test bike. 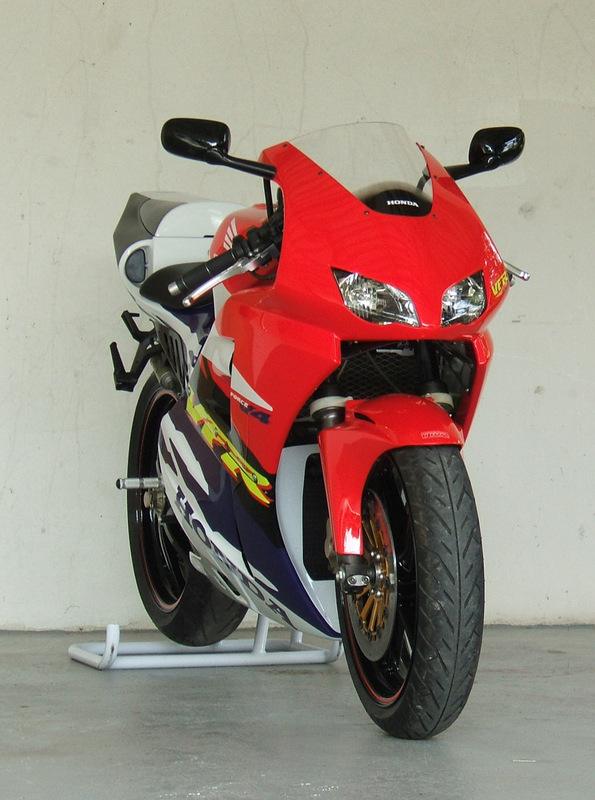 In general, our goal has always been to make our projects either more radical, higher performing or more modern looking than the bike it was based on. In this case, we have responded to mails requesting something less radical but at the same time, more visually striking and certainly more high performing. The concept is to make an everyday road bike that will feel equally at home commuting, Sunday B road riding, or taking the Mrs out for a latte. Have we at TYGA gone soft? I was starting to wonder myself until I actually took the completed bike out for a spin and was surprised at how hard the NC30 can be made to perform. 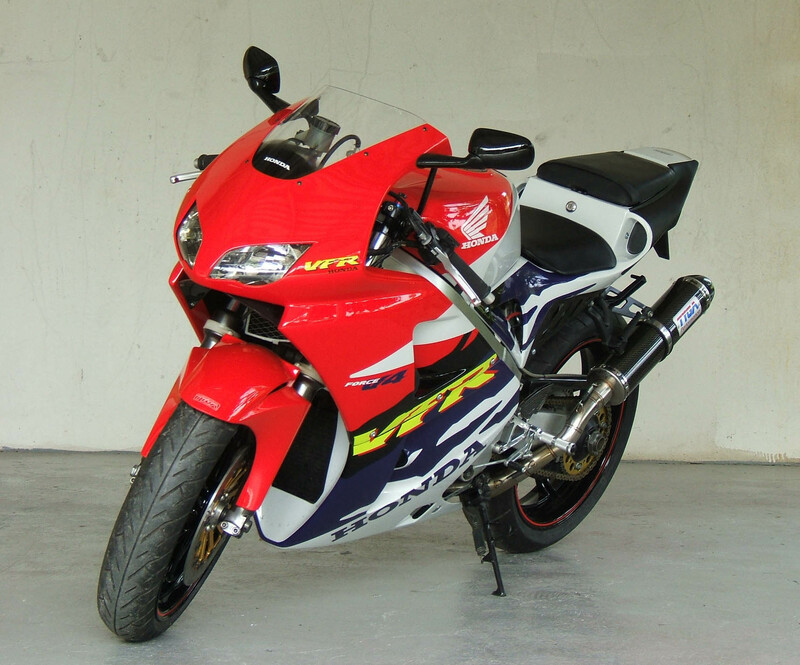 It is as fast and rewarding as ever and certainly not to be confused with the latest crop of lethargic small capacity sportsbikes the public is nowadays expected to buy. 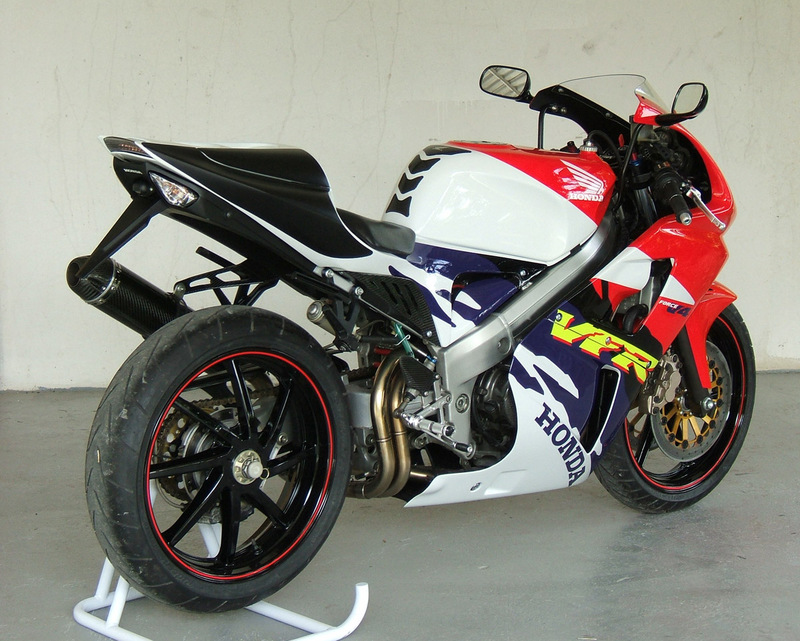 As usual with our projects, the most obvious modification to this bike is the bodywork. 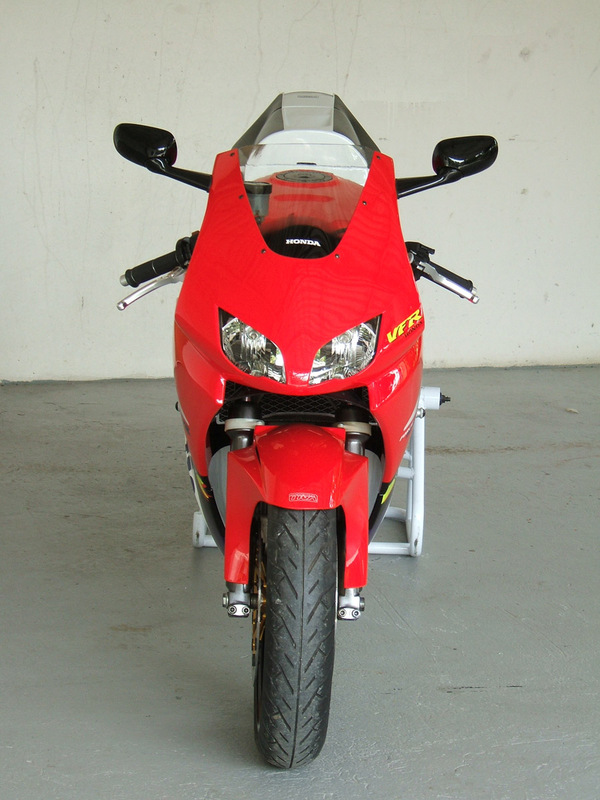 This VFR400R uses the popular T10 front fairing and the Twin Seat cowling which were introduced to our range earlier this year. 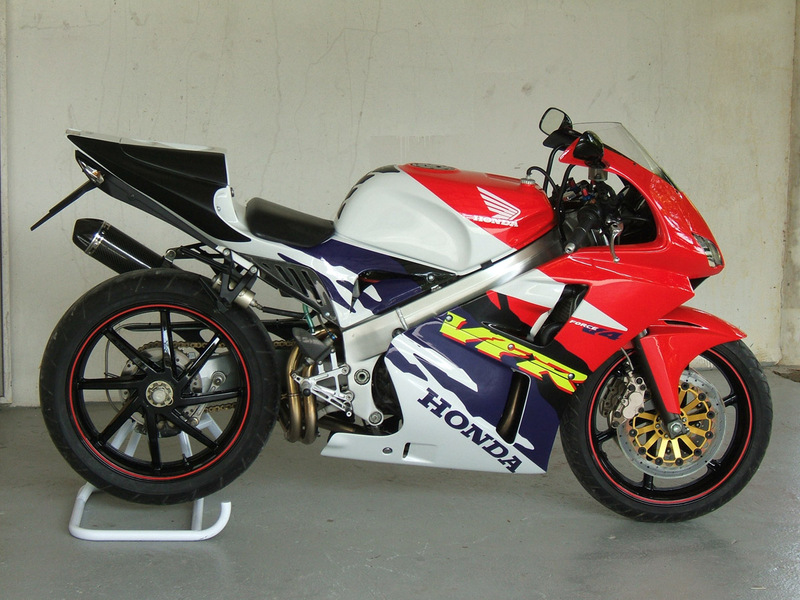 The kits retain the use of the Honda subframe, seats, mirrors and most other components but the kit are supplied with all the other parts needed to complete the transformation. 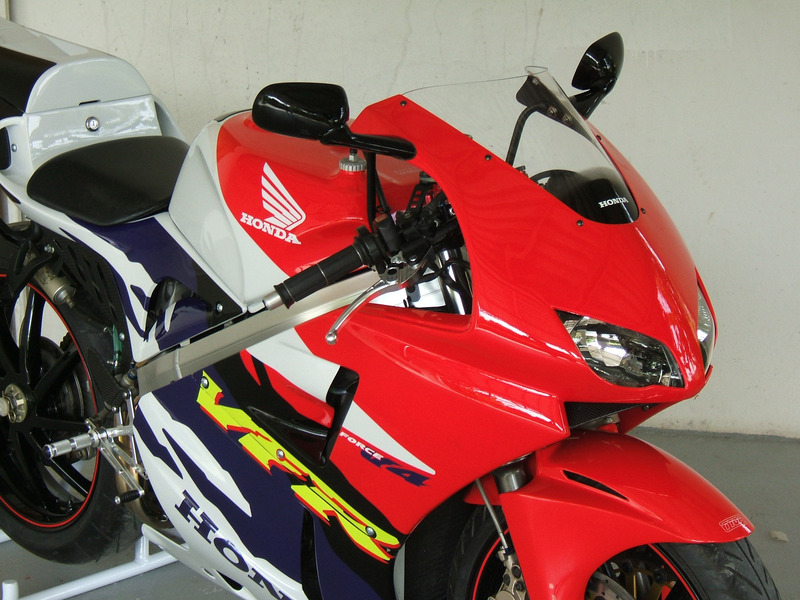 Some aspects of the bike's styling remain unchanged from when this bike was built in 1989, such as the fuel tank and the lower cowling. The fuel tank looks very dated but equally distinctive and we make no excuses for retaining the 1980s quirky bits like the breather hose on the top of the tank and the analog instruments. It all adds character. I wanted to take some photos of this kit next to a stock NC30 but although we have a few other examples, not surprisingly around these parts, they soon get pulled apart and never put back in the same way that they came from Honda 20 years ago! 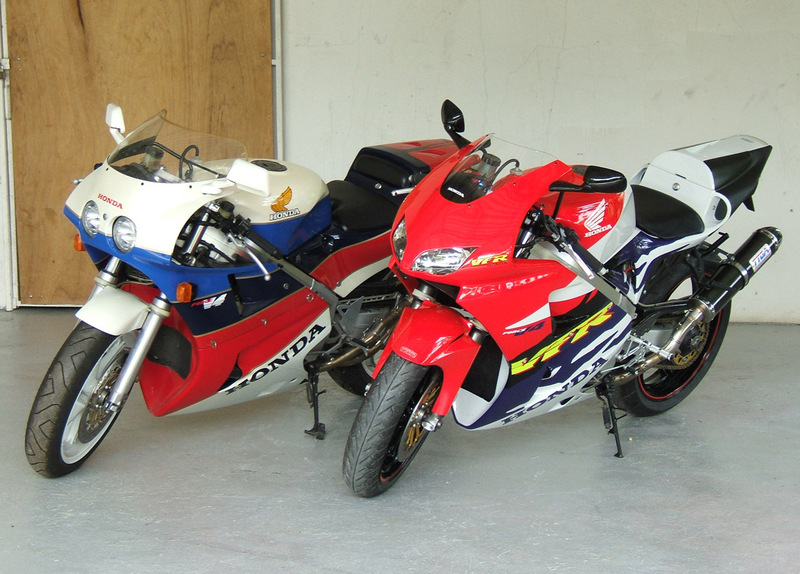 The next best thing to a stock NC30 is my stock 1988 RC30; so I included a photo showing the two to compare how the two bikes compare and contrast. Frame, engine and chassis, lower cowling and fuel tank components are pretty similar but the differences are very obvious too. Like most modern designs, the T10 upper cowling uses a modern reflective type twin headlight set up rather than the original glass refractive round headlights so popular 20 years ago. 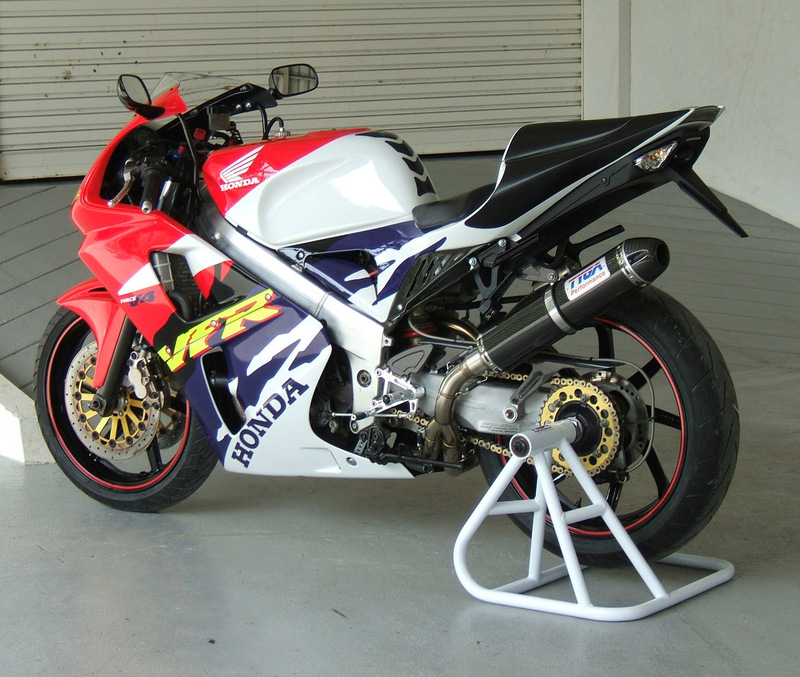 It is a derivative of our T8 fairings used on other model bikes and we have adapted it to fit the NC30 and match the stock lower fairing. 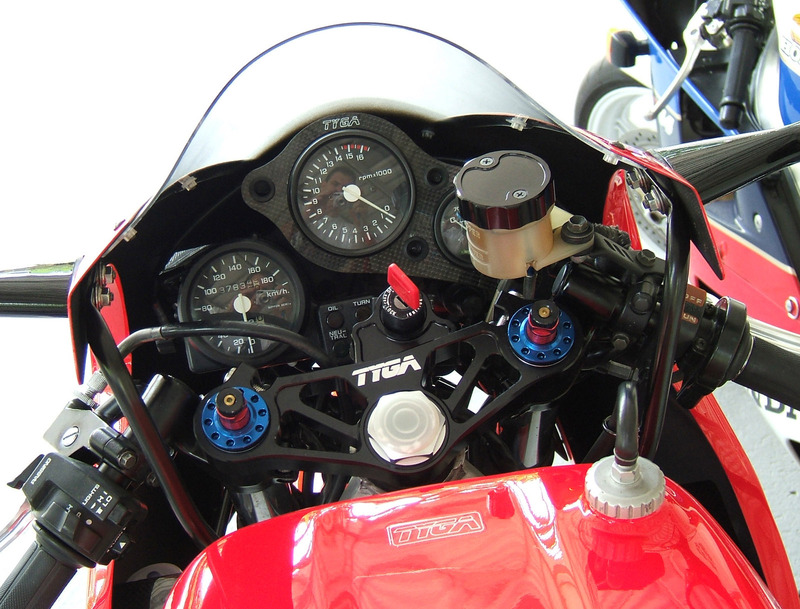 The stock mirrors are mounted on a TYGA upper stay and the instruments on a TYGA meter stay which eliminates the ugly external front mounting point. 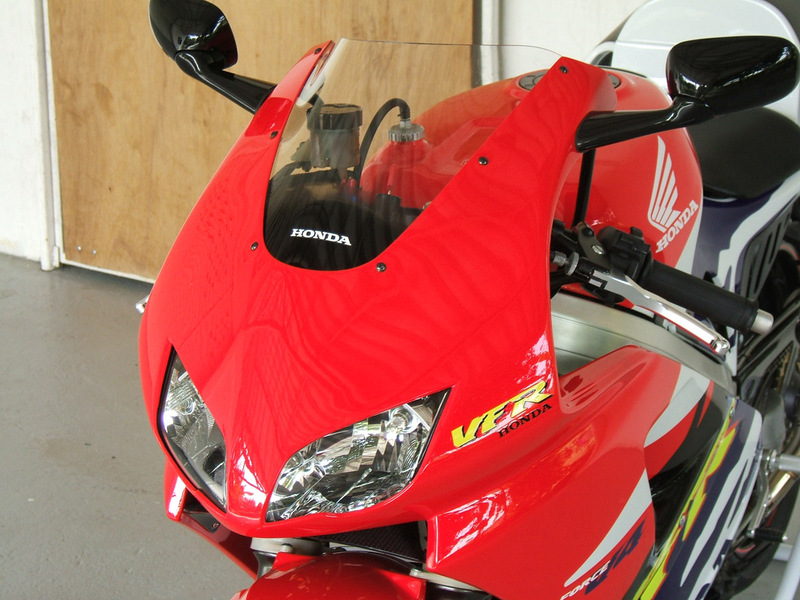 Being a two piece, the fairing is quick and easy to install and remove and there are less joins than stock to spoil the lines. The screen is a TYGA design and is available tinted and clear. This particular one is clear but I blew some flat black paint in the base and feathered it out to give it a factory affect. 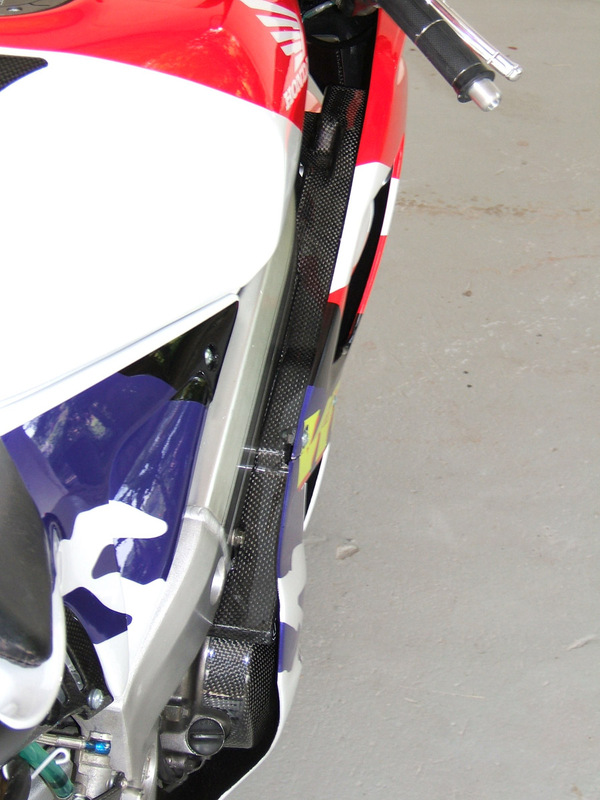 The air ducts are carbon which will be an optional extra when ordering this kit. 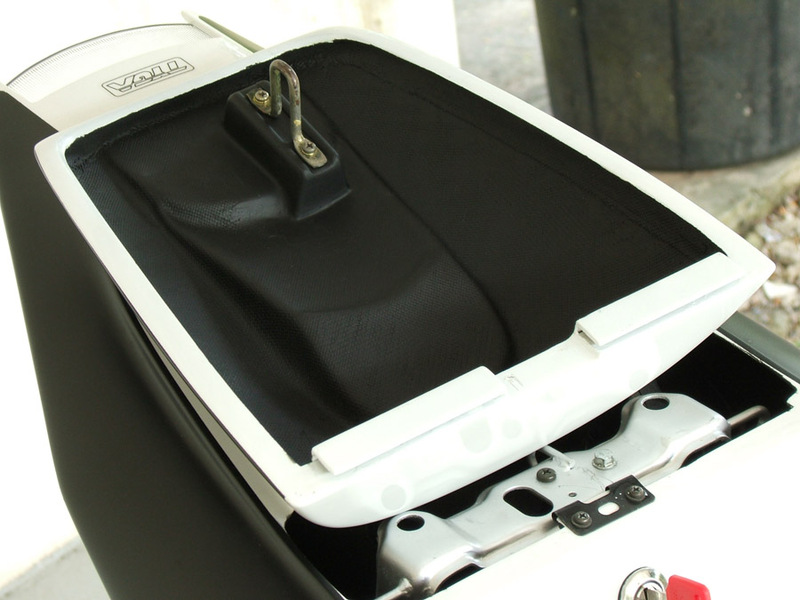 The seat cowling is our answer to people who liked the 400 TYGA tail but wanted to carry a passenger. 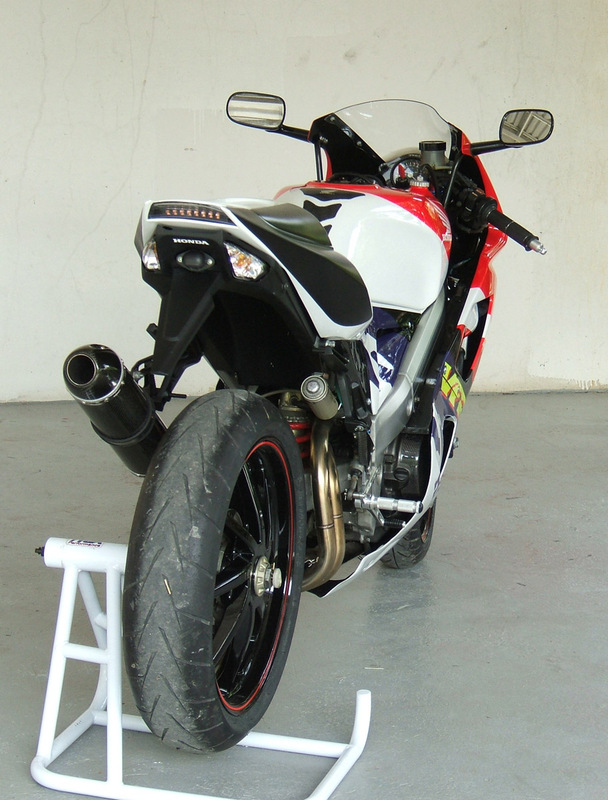 By retaining the stock subframe without any modifications required, it is easy to replace the stock plastic on the bike with the TYGA Twin version and still have the ability to carry a friend as well as your packed lunch under the seat. If you prefer to increase the storage capacity and temporarily do away with the passenger thing you can replace the seat pad with a cowling which just requires 5 minutes with a screwdriver to remove the latch hook from the passenger seat and screw it on the cover. This way you can have the best of both worlds! 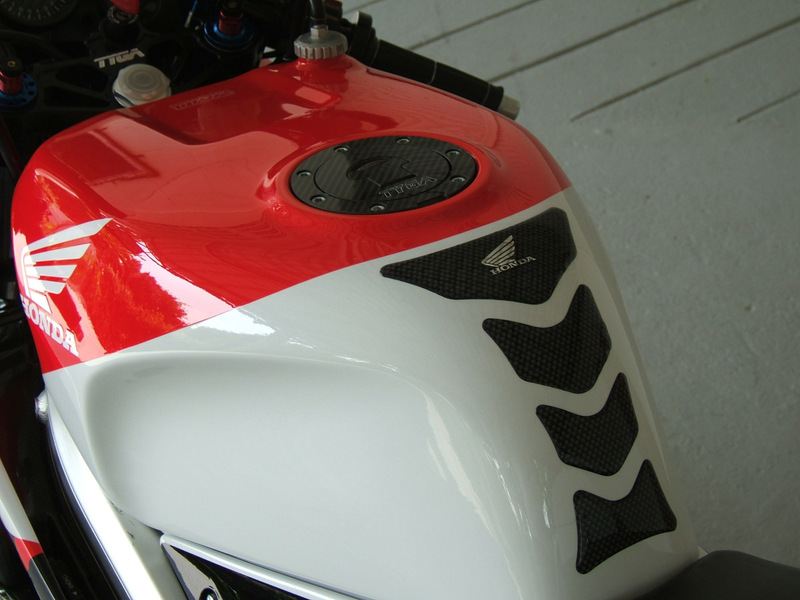 The seat cowling is supplied with a special undertray/ battery holder which also incorporates the rear turn signals and the seat cowling has a modern LED taillight fitted. 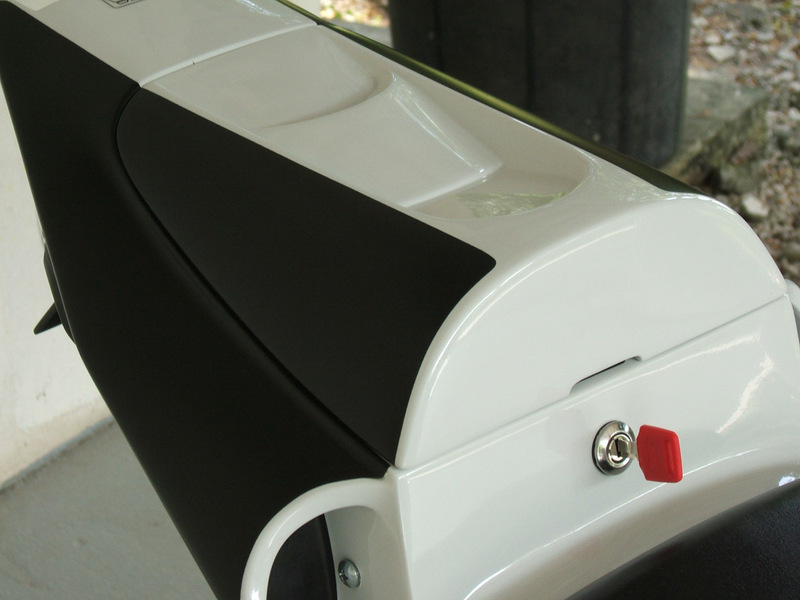 We leave the front indicators to be sourced by the customer. The original ones could be reinstalled, flush mounted ones or LEDs on stalks sourced etc. 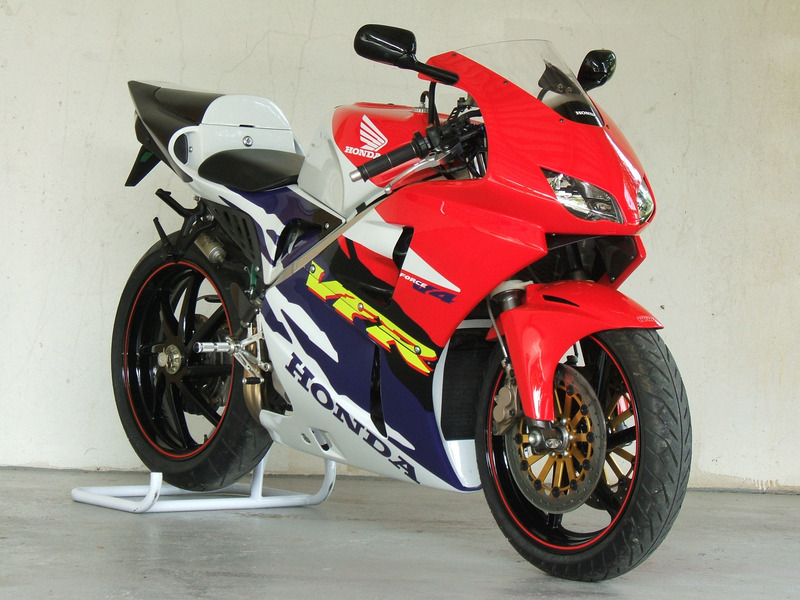 Rounding off the bodywork modifications, is the RC211V style front fender. 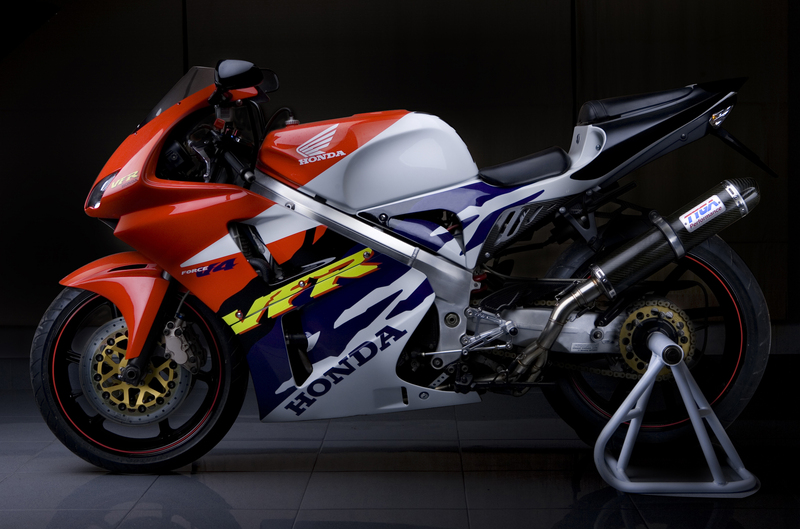 Paintwork is an adaptation of the stock classic RVF colour scheme which is instantly recognisable as belonging to the V4 Hondas. We went for the latest scheme with the fluorescent yellow font and obviously changed the order of the lettering to suit our VFR model. Although the photos don't really do it justice when shown on a computer screen, the red is really bright and some special fluorescent red was especially ordered and mixed for this job. 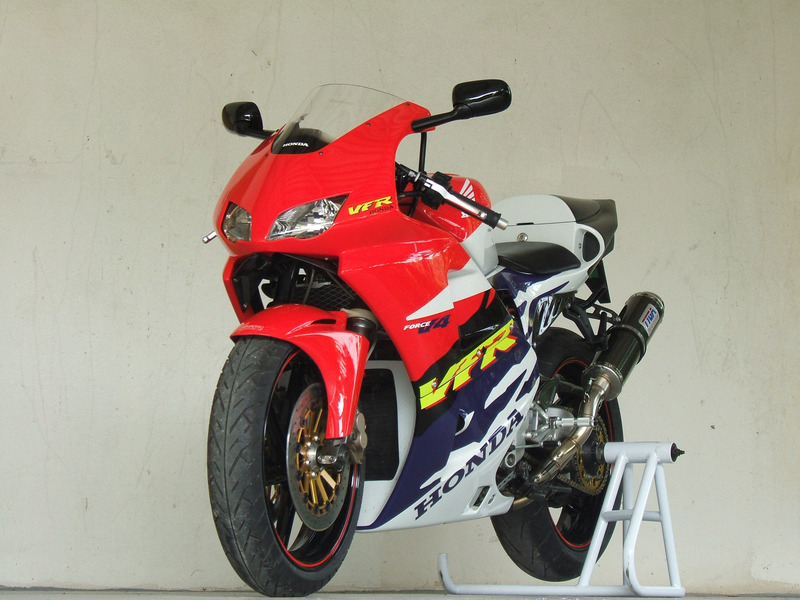 The colour is as close as we can get it to the HRC red as used on the OKI Suzuka 8 hour etc. I really love it and will be using this on some of our future projects for sure. 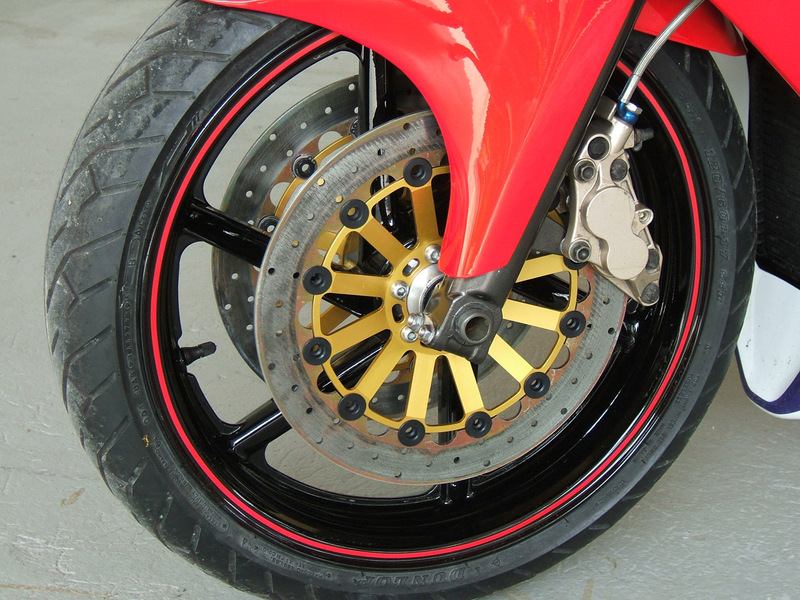 A ring of the same colour was painted on the wheels and carefully masked before the gloss black applied to give a durable and professional finish to the rims. 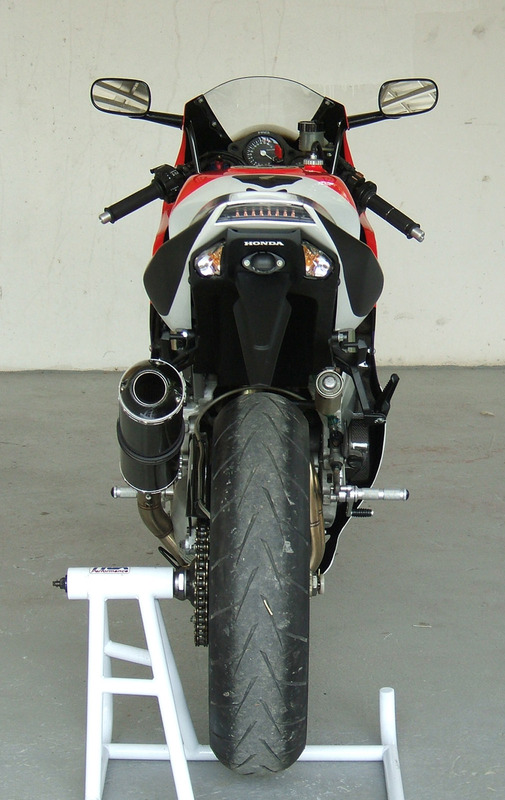 Performance enhancements for this bike are subtle but extensive. 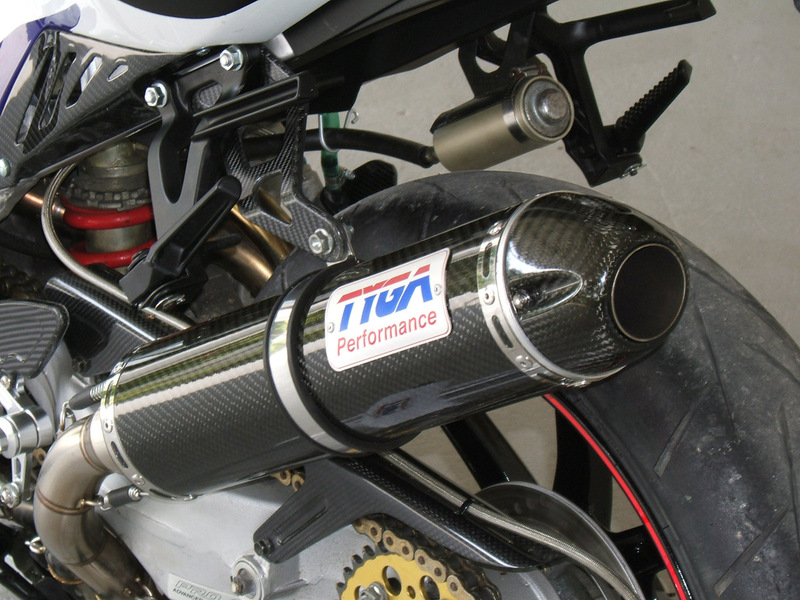 A Tyga full race system with a new type of carbon silencer with a carbon end cap is responsible for most of the increase in power. The air box is a carbon one with 6% extra capacity, Matt has rejetted the carbs and got it pretty much bang on the money with 112/115 mains. To finish off, the wire splice was done on the ignition to allow for full power and full speed! 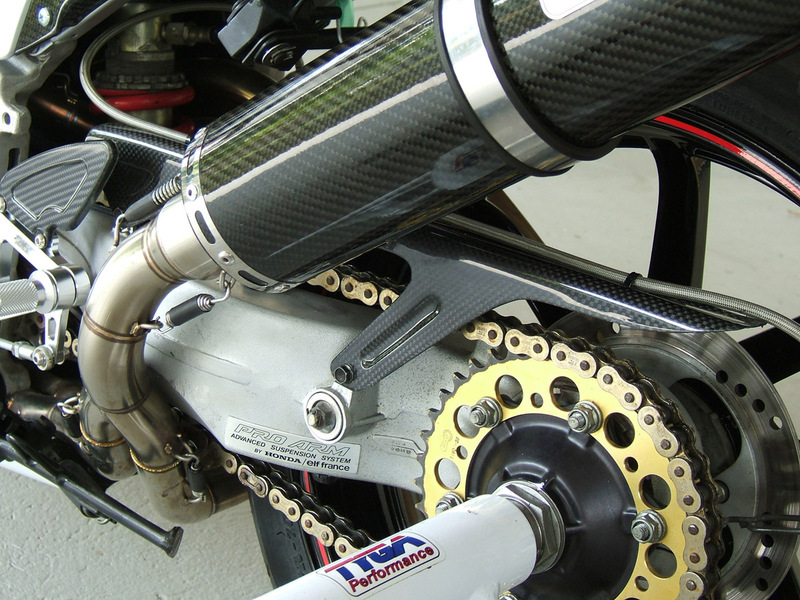 The results of these modifications mean that the bike pulls hard from just over tickover all the way to 15,000 rpm. 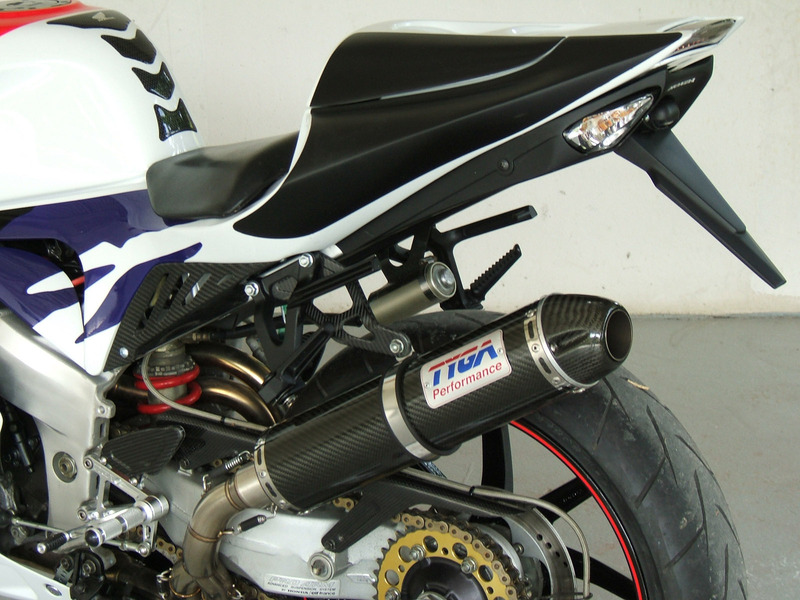 The exhaust note is audible but the baritone in note and can be tolerated by the public and appreciated by the rider. To balance the improved power, we were tempted to go for some radical chassis changes but instead settled for improvements on the stock set up. The front forks have been dismantled and carefully rebuilt by Matt and fitted with TYGA adjusters allowing for a full range of adjustment. 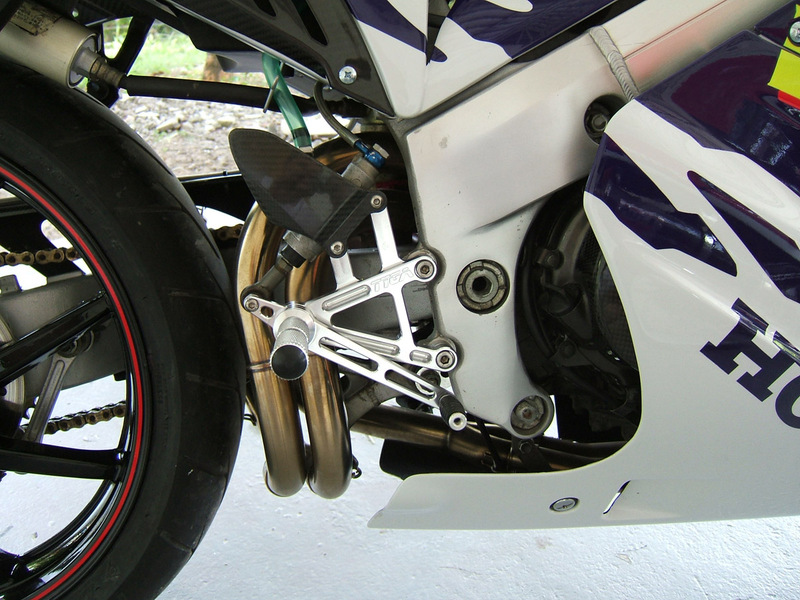 The forks are held in a place with a TYGA billet CNC machined top triple clamp which is both lighter and stronger than the stock one it replaces. 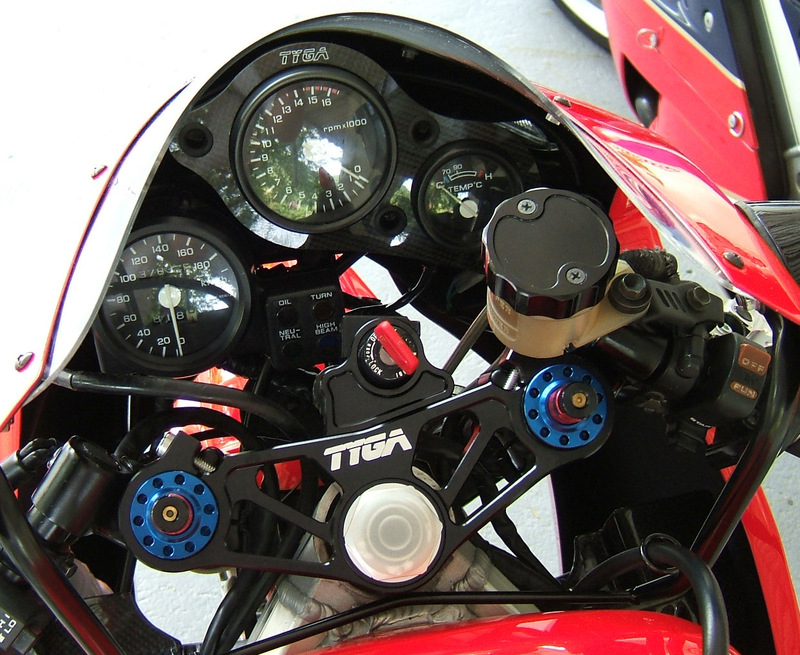 To add to the aesthetics of the cockpit area, the front brake reservoir lid was replaced with a TYGA one and the instruments fitted with a carbon surround. The rear suspension is stock but despite the age it still work surprisingly well. To continue with the performance enhancements, the bike is fitted with a TYGA step kit which makes for a more sporty riding position but, perhaps more importantly, allows very precise and slick gear changes. 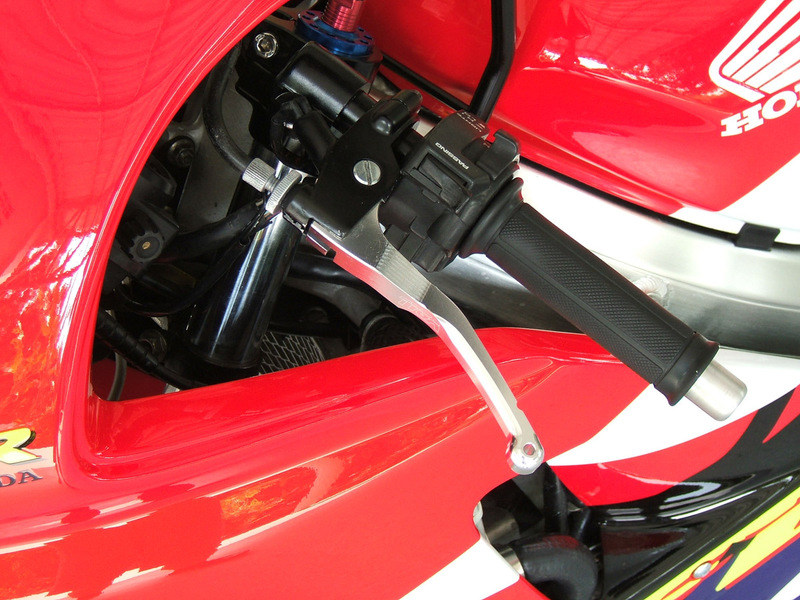 The bike also has our TYGA CNC brake and clutch levers. Stainless brake hoses are fitted all round and EBC brake pads installed in stock 1989 NC30 callipers bite on locally sourced stainless rotors to give a more than adequate braking set up. 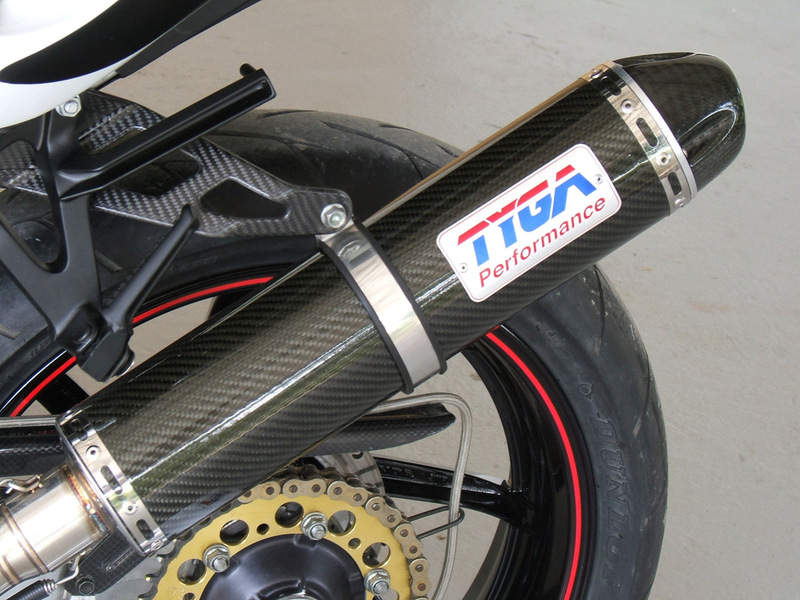 Other modifications include the replacement of stock items with TYGA carbon products. 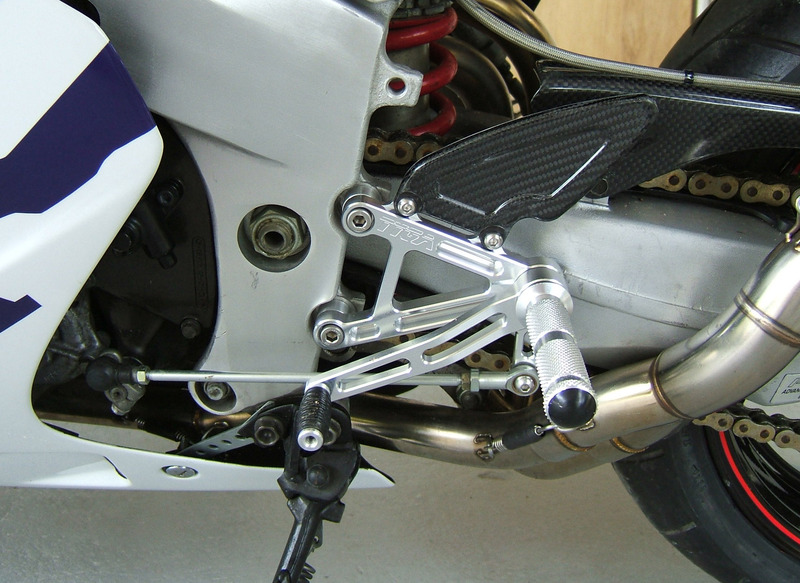 The frame in-fills, the chain guard and the exhaust hanger are all TYGA and other TYGA carbon parts used to finish off the project include the engine armour and the fuel cap cover as well as optional carbon side covers on the seat cowling. 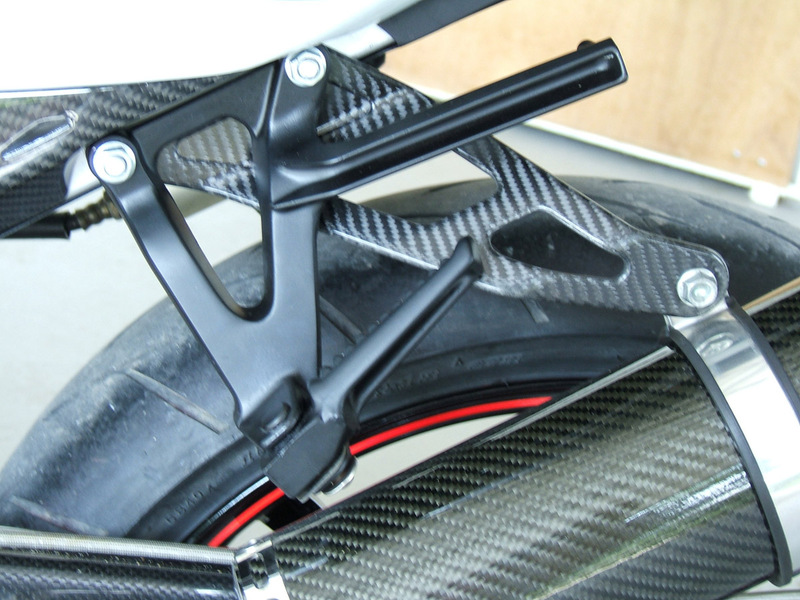 The changes are subtle but effective and the aim is to have a motorcycle with no areas on show with worn or cheap looking components.